Taking your pet with you on vacation or when you travel for work or even when you move is extremely important, but how can you get them from one place to the other when you can’t drive but still want to keep them safe? An airline pet carrier is the way to go. 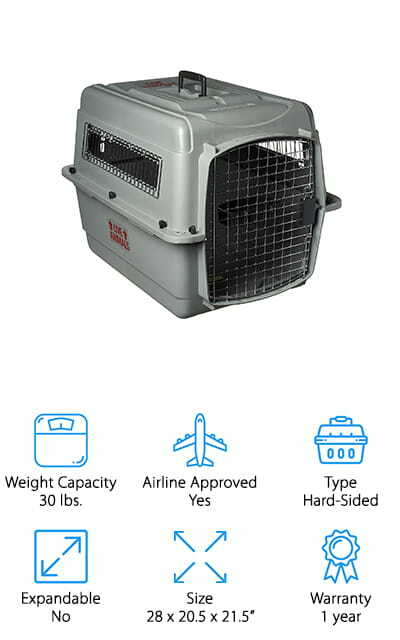 This airline pet carrier buying guide will help you figure out the best options currently available so you can get your furry friends where you’re going just as safe as you are. Weight Capacity: You want to make sure that your pet is going to be safe in that carrier, which means that you need to know the total weight capacity available in the carrier. Make sure you have some extra weight available too. Airline Approved: You don’t want to get a carrier and have everything working great and then find out that your airline doesn’t allow it. Make sure that your airline is going to allow the carrier to be used on the plane. Type: Is it a soft sided case or a hard sided case? For the most part, this is going to be personal preference, but keep in mind that a solid case is going to be a little less comfortable for your pet but more secure. Expandable: Does the case get larger as needed or is it only one size? You want to know how it’s going to work for your pet (or pets) and also how it’s going to work for the specific trip that you’re going on and the plane. Size: What specific dimensions are there for the carrier that you’re getting? Make sure that your pet is going to fit and that they will be comfortable. They should be able to lay down and stand up at least, but you may want a little larger. Warranty: How long is the warranty on the product? You want something that the company is going to stand behind and that means something with a good warranty. Make sure you get a warranty that proves it’s going to last. You want your pet to be comfortable while you travel and that means making sure you have a great carrier. These airline pet carrier reviews will, hopefully, help you find the best airline pet carrier for sale. That way, you’ll be able to enjoy your trip, and so will your furry friends. 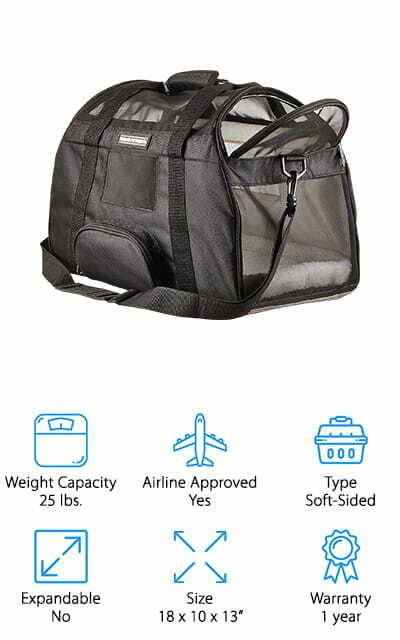 This soft sided option actually has full mesh sides to provide plenty of air flow and breathability and is the best airline pet carrier in our opinion. TSA compliant with most national airlines. Great for small to medium size dogs or cats, this carrier can hold up to 14 pounds and even works for smaller pets like rabbits, guinea pigs and hamsters. You’ll have a fleece mat over a stiff board to provide the right amount of support but still plenty of comfort for your furry friends. There’s a large mesh pocket on the side to hold your snacks, treats and other accessories as well as expandable sides. It’s a top load carrier, which makes it easier to get your pet inside and it collapses fully when not in use. There are even seat belt buckles and a luggage loop to help secure your pet in your vehicle and there’s a guarantee on the product that says it’s going to last. Complete with a 1 year warranty and a leash inside the carrier, this is definitely a safe and comfortable way to help your pet travel. Our best cheap airline pet carrier is a simple carrier, but that doesn’t mean that it’s not going to get the job done. In fact, this carrier has a spring wire frame that allows you to push the back of the carrier down to fit under the seat. It also has roll down flaps to keep your pet more private and mesh windows to give them plenty of air. The top and side entry options have locking zippers to make it easier to get your pet in and keep them in, plus there’s a padded carry strap that helps you carry it around easier. Inside the carrier is a faux lambskin liner that keeps your pet more comfortable and there’s even a pocket on the side to store treats, your leash or anything else you might need for your pet. Guaranteed safe and comfortable for your pet to travel, it’s best for pets up to 16 pounds. 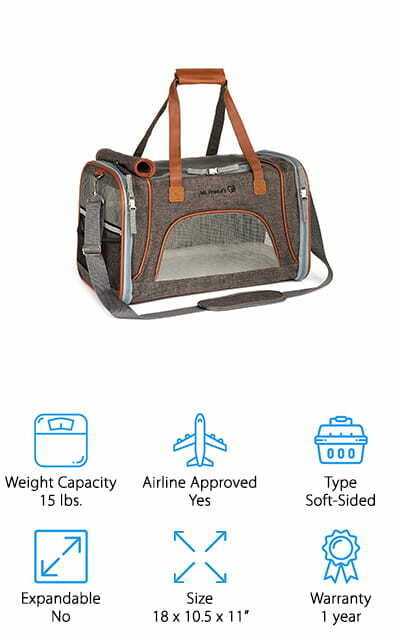 This pet carrier is designed for small dogs, cats or other animals and is airline TSA approved. It has a shoulder strap and carry handle so you can take it with you in the way that’s most comfortable for you. On top of that, it’s available in 2 different colors to match your personal preference (or your pets’ personality) and holds its shape when zipped to keep your pet safer. 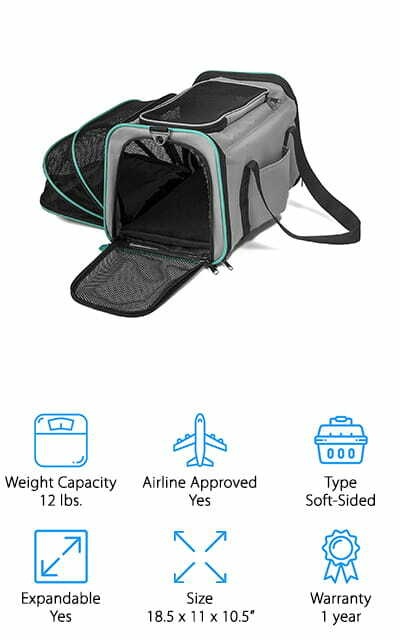 Lightweight and stylish, this best pet carrier for airline travel has padding on the inside to keep your pet more comfortable and plenty of mesh surrounding to make sure they have air flow. It folds flat when you’re not using it and is entirely waterproof so you can clean it easily. The zippered ends and the sleek design are definitely going to make a great option for taking your pet on that next trip. You’ll even get a 2 year warranty that says you’ll love it or you get your money back. This vintage style pet carrier is one of the best airline approved pet carrier options and actually has fleece bedding on the inside, making it more comfortable for your small cat or dog. The premium design zippers are on both sides as well as the top so you can get your pet in the easiest way possible. The sides even have pockets to carry treats and more. Plus, you’ll have a handle and shoulder strap to make it a whole lot easier to carry. There are several color options and plenty of mesh around the outside to make sure your pet can get plenty of air as well. 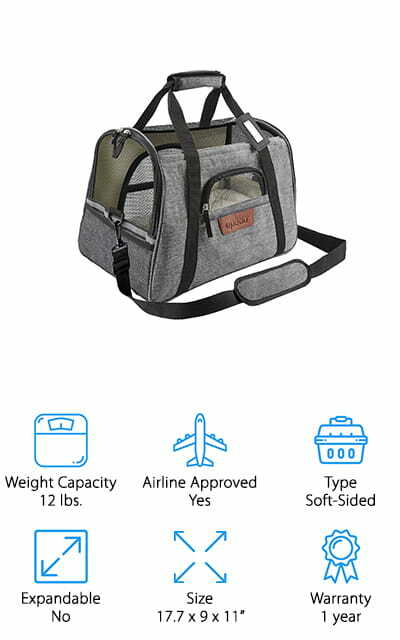 Designed for up to 15 pound animals, this carrier will allow your pet to lay comfortably and the whole thing is TSA approved. Waterproof and lightweight on its own, this bag even has an ID tag and fits easily under the seat in front of you. This soft-sided carrier has a handle and a shoulder strap so you can carry it however you want. It also has 2 fleece pads on the inside that are washable and comfortable for your furry friends. There are even pockets on the outside to hold the extras that you need for your pet. 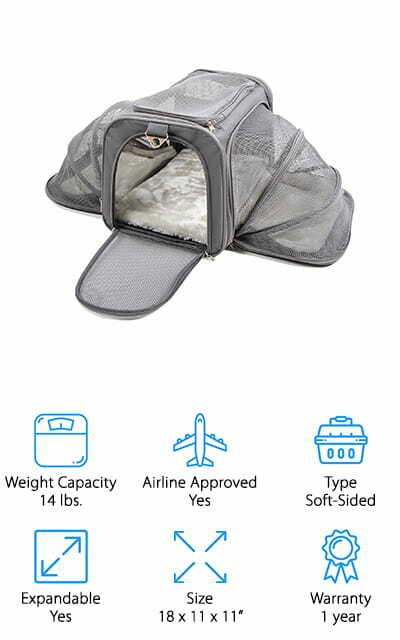 TSA approved, this best airline dog carrier has 360 degree mesh panels to provide plenty of airflow for your pet and to give you full visibility. It’s also puncture resistant and has flexible plastic supports to keep it strong for your pet but also foldable as needed. If you need to feed your pet or comfort them while in the carrier there’s even a small feeding window to make this easier. This lightweight bag is able to support up to 25 pounds and has just the right amount of fabric to make it durable without being too oppressive for your pet. It’s great for just about any weather too, keeping your pet warm or cool as needed. This expandable pet carrier has a standard design with an extra section to the side that expands to give your pet a little bit of extra space. You get a top and front zippered closure to get your pet in however it’s most comfortable for you and them. You also get a shoulder strap and handles that will make it easier to carry and an exterior pocket that holds everything else you might need for the trip. Available in 2 different colors, it’s designed for pets up to 12 pounds. There’s plenty of circulation available with the mesh sides to this carrier and a comfortable pad in the bottom that makes it easier for your pet to lay comfortably. When you’re done with the bag you’ll even be able to fold it down flat to take wherever you need to go, making it the best airline cat carrier. This cute bag is available in several different colors and 2 different sizes, to give you plenty of options. The handle strap and shoulder strap mean you can carry it however you’re most comfortable and there is even a pocket on the side to store extras you may need. The feeding zippered section allows you to pet or feed your furry friends without having to worry about opening the entire carrier. The mesh extends all the way around and over the top so your pet can see and get plenty of air, plus you can see them. There are safety buckles and straps to keep your pet securely in the case and to keep the case secure in a vehicle. It’s also airline approved and has an identification tag and detachable strap. The Sherpa lined bedding also provides a comfortable place to lay as one of the best airline approved dog carrier options. 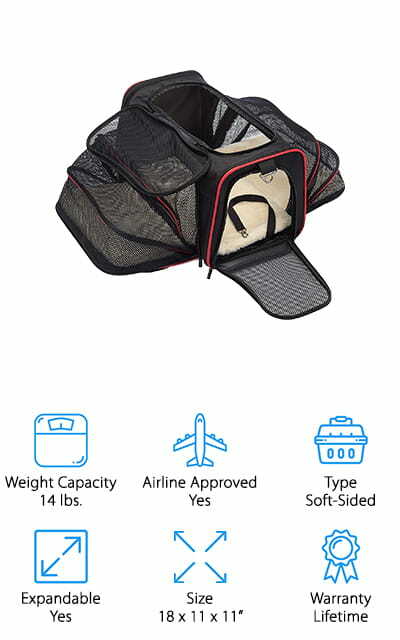 This best airline approved cat carrier looks like a standard design but it actually has 2 expanders on the sides to give your pet even more space to move around and feel comfortable. It has mesh all the way around to give your pet, and you, plenty of visibility. The top load or front load lets you get your pet in any way you want. It’s made of a strong mesh that’s resistant to claws and has a metal wire frame that keeps it sturdy. Airline approved, it even comes with a 100% money back guarantee to make sure you’re happy with it. Lightweight on its own, this carrier even has a soft cushion on the bottom to keep your pet comfortable. 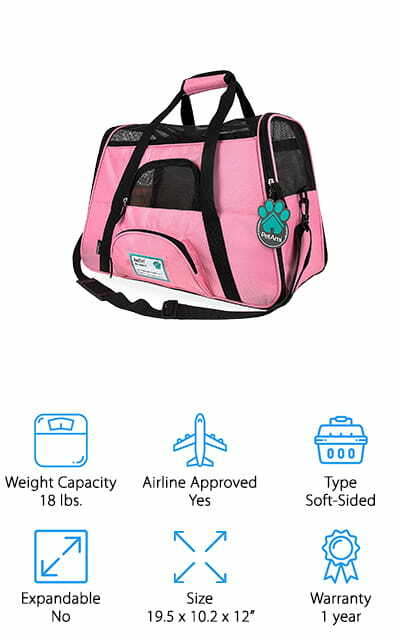 Pets up to 14 pounds are able to ride easily in this carrier. All you need to do is put your pet inside and head out on vacation. 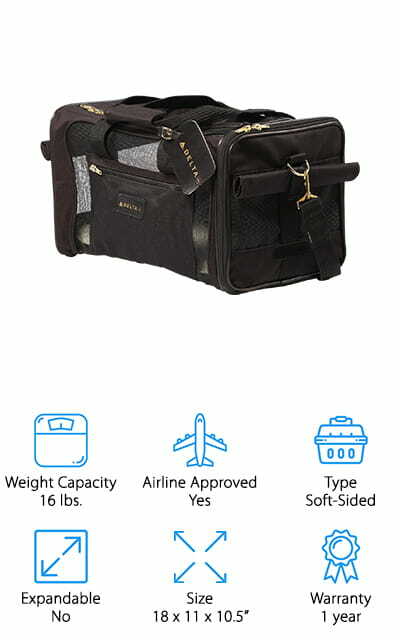 This airline approved pet carrier is soft sided and definitely looks sleek and stylish. It has just the right amount of mesh all the way throughout so you can see your pet and they can see out. There’s a zippered section on both sides to make it easy to get your pet in and there’s even a zippered section to give your pet some attention or give them some food. There are 2 fleece mats on the inside to keep them comfortable and the entire thing is water resistant and machine washable. The carrier itself is durable and still lightweight enough that you can carry it around easily. Attach your pet’s leash to the hook on the inside and you won’t have to worry about even your more escape ready pets. There are shoulder straps and a handle, as well to make it easier to carry. This best pet travel carrier is actually hard-sided and provides a stronger and more durable design. It has wire openings on two sides as well as the front and a handle to carry it by. Available in several different sizes to get your best fit it’s entirely made in the USA as well. There’s enough space to make sure that your pet can stand and move around easily, plus you get a sticker that lets others know there’s a live animal inside. 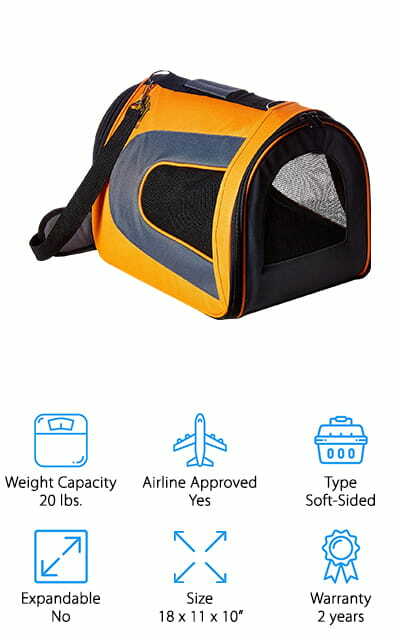 With a reinforced steel for the door, you can feel safe putting your pet in this carrier. Made with 25% recycled materials, this kennel is moderate in weight but able to hold a pet up to 30 pounds. It’s TSA approved so you can head out on vacation with no problem at all, and enjoy your time.